Oke aangezien heel veel blogs tegenwoordig giveaways houden, en iedereen wil dat de ander erover blogged, heb ik besloten iedere maand 1 post te besteden aan giveaway alerts. Iedere keer als ik een leuke giveaway tegenkom zal ik deze hier plaatsen, en zal deze post dus blijven updaten. Zo voorkom ik een beetje dat er straks elke maand 20 posts zijn over giveaways. En zo kan ik het meteen een beetje overzichtelijk houden voor jullie! Dus bij interesse neem afentoe een kijkje bij het giveaway topic! Alright, everyone are having giveaways lately, and everyone wants that the other will blog about it. So I decided to do 1 posts each month with the giveaways. I will update this post every time that I see a nice giveaway. This is because I don't want every month 20 posts with only giveaways, boring! So this is much better! When you're interested in giveaways, take a look at this post sometimes! The first is from Scandalously Polished. She's having a piggy paint giveaway!! You can win a $15 coupon for their website! Giveaway ends september 22, and you only have to be a gfg follower! You can join her blog here! 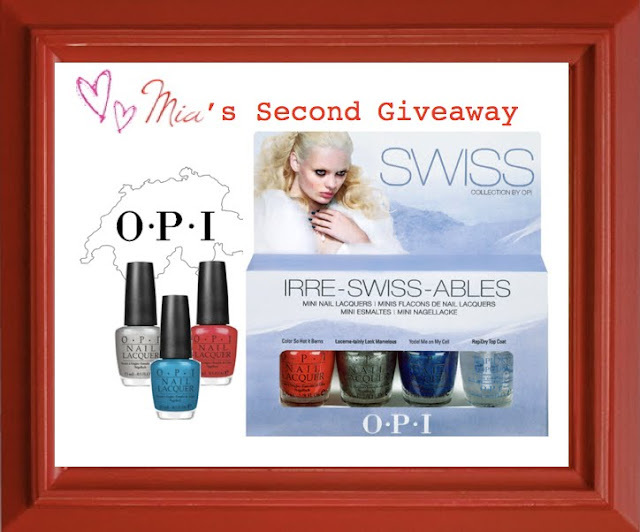 The second is from Mia's Little Corner, she's giving away a nice OPI package. You can enter until October 9, and you can enter here. Oh and make sure you take a look at her lovely blog! Scandalously polished is also having a giveaway! She reached her 666 followers, and you can win some cool stuff! You've got to check out her blog for yourself, one of the prices are some polishes from the awakening collection from China Glaze! The giveaway is open until 10-10-2010, and you can enter her giveaway here! Polishing the Nails is having a giveaway too, you can win a lot of gorgeous prices! Sharana's corner is having a giveaway too. So sweet, she's giving away 2 Nfu Oh polishes! You can enter the giveaway here! And you can enter until october 29th. Bright Lights, Big Color is having an : I wanna thank you giveaway, so sweet! You can win a lot of nice prices, one of the prices is a mini OPI package! For the other prices you can check out her blog, the only thing you've got to do is being a follower! Imperfectly Painted is having her 500 followers giveaway! You can win a lot of amazing polishes. Read her rules and you can enter here until October 29th. 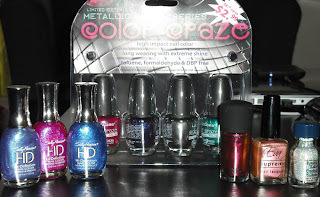 Jackie S of Candy Coated Tips is giving away the China Glaze Awakening set, China Glaze Ghoulish Glow, China Glaze Matte Magic and Sally Hansen Hidden Treasure. Contest ends 8 Oct, and you can enter here.